All returning merchandise must be "New" in its original packaging, unused, unaltered and unchanged from its original state. Special products must be returned with all instructions, manuals, warranty cards, etc. Any merchandise returned that does not meet this criteria may be subjected to a $25 repackaging fee or refusal. Any pet hair or lint removal from suits will be charged a $10.00 cleaning fee. 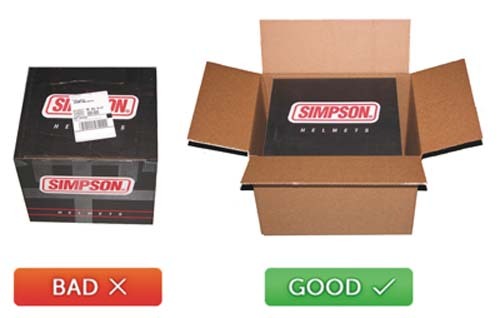 The images below show how to properly return a product. Due to several shipping warehouses, some returns may be required to have a separate RMA number to be returned to the correct location. Due to the nature of their use, racing parts are not covered by warranty once they have been used. If it is determined the part is defective (before being installed) we will replace it or offer a refund (depending on warranty from each manufacturer). No refunds will be issued for shipping charges. NOTE: Once the return has been received please allow 3-5 Days for the return to be processed and credited back to your card/account. You should be able to see the credit within 24-72 hours after the credit has been issued (depending on the card issuing bank). PayPal credits appear immediately on your account. You will also be notified vie email when the credit is issued. For exchanges please contact a representative at 208-906-0702 as there are exchange fees that vary due to certain item(s) and shipping costs.